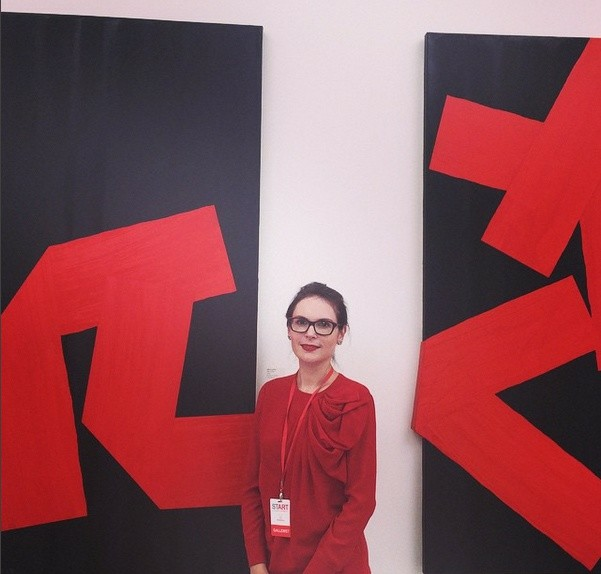 It was a great pleasure to be part of START Art Fair at the Saatchi Gallery last month. START is dedicated to promoting works by emerging artists, and the fair has a very exciting energy to it. On our stand we presented a mix of works by Alex Gough, Christoffer Joergensen, Rikizo Fukao, and Xawery Wolski. Although these artists work in very different ways, they are united in their experimental practices and unique ways of creating art. Joergensen's woven photographic work, 'Die Vereinigung' (2012), was the talk of the stand. START was extremely enjoyable; it was wonderful to meet so many fellow art lovers and to spend time in the company of other gallerists committed to promoting emerging artists. We were delighted that one of our works, Rikizo Fukao's 'Black and Red' (2006), was selected for the cover of START's catalogue. On Saturday the 12th September, Alex Gough presented a talk at our stand explaining his artistic process and inspiration, which was followed by a lively Q&A session. Apart from our own stand, one of my favourite parts of START was the collection of curated projects by Tokyo-based art collective teamLab. teamLab's contribution was a collection of three different, but interrelated digital projects depicting a world alive with flowers and butterflies. It was an immersive and other-worldly experience that will stay with me for a long time. If you missed the opportunity to visit our stand at START, highlights from the fair can be found on the lower ground floor of Gallery Elena Shchukina until 29th October.